My wedding is next week. The fact that we have reached the point that I can say that really blows my mind and I didn't even really realize it until yesterday when someone at work asked me about it. I'm not sure why the 10th just keeps sort of sneaking up on me like this but it has. Shouldn't I be way more stressed and way more anxious right now? Maybe it's still too early or maybe it STILL just hasn't quite hit me yet. I still feel calm and not stressed out like I expected I would feel at this time. We had a meeting with the hotel last Thursday and went over some of the final details. I still feel like there were things I forgot to ask. All the prices have gone up since we originally booked it in December. They probably went up in January but of course we get our contract prices. We agreed to the $100.00 ceremony arch dressing which is basically tulle that they will drape over the arch. No climbing on ladders for us. We will host guest parking which should run us no more then about $100.00-$150.00. We also settled on $888.00 in hosted beverages which is only about $675 pre tax and gratuity. Damn taxes and tips are eating into my party budget. I was very adamant that I only wanted to host alcohol and not soda. Bottled water of course was out of the question. Why use the money on that when they can drink free water if they don't want alcohol? Hubby and the wedding planner were against me on this saying that more alcohol will get used because if someone wants soda but can't get it they just might get a drink. Then there was also the designated driver point. Won't we cater to them? My answer was no. Designated drivers can drink water. If you want soda you can buy it. Or...you can drink water. I've been to plenty of weddings where nothing was hosted least of all soda pop. I am still not sure what the conclusion was on that one but I still feel strongly that it should be alcohol only. Either way, when it's gone it's gone. I forgot how small our reception room is and actually didn't even really know what it looked like because it was under construction when we booked the place. It will fit exactly 80 in 10 person table rounds but not a table more. We might move to a bigger room which doesn't have the floor to ceiling windows that we like about the smaller one but it is bigger and has higher ceilings. The room was bare and empty so it was hard to tell how it's going to look all jazzed up with linen covered tables and chair covers. As soon as we got home I started working on the seating chart. I annoyed Mj by trying to ask him questions about where to seat his guests while he was trying to cook but to be honest there never is a really good time. Time is ticking away and I need to get this done before I get even busier with other tasks. I don't know his people like he does and he's certainly not going to sit down and draw little circles on a paper and go through the guest list and plug people in himself so he's kinda gotta work on my time for some things. I managed to get force most of the info I needed out of him so it's mostly done. I almost screwed up BIG TIME by waiting too long to order my place cards. I realized just last week that the ones I was originally going to order were flat and I didn't want the added expense of using place card holders so folded was the only way to go. I had to search to find a reasonable price elsewhere...and fast. I knew I was in trouble when I got an e mail saying my order would ship by 7/12/10 when my wedding day is 7/10/10! Uhh..not going to work. There would have been plenty of time if I didn't want them personalized which I do so I am now having to pay extra on top of the already too high $10.95 for rush shipping. I so hate that because technically I dropped the ball on this one and it's gonna cost me. 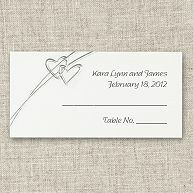 At $35.95 the best price I found was at Exclusively Weddings.com. It would have been nice to have them in Pink and even have the guest names pre printed but both options were too expensive for me. I'm still cutting it close on this order but I am choosing to believe they will get here in time rather then stress out over it. The planning and the countdown continues! I'm with you... alcohol only. If they want soda they can pay for it. My reception hall belongs to a church so there's no hard alcohol allowed. So it's wine, soda and punch with apple juice for the kids. Saved us a bundle there. the days are only going to fly by now! WOW! Next week! Yaaay! So exciting! I can't even imagine! We've got a wedding the 10th too - one of our groomsmen & the Mr. is in his wedding too. Thanks for you comment on my blog - you have a new follower too! You're almost there girl, can't imagine how I'll feel 10 days out...esp since I'm at 100.